Sixteen patients and their families have been evacuated from besieged rebel-held suburbs of the Syrian capital Damascus, the Red Cross said. 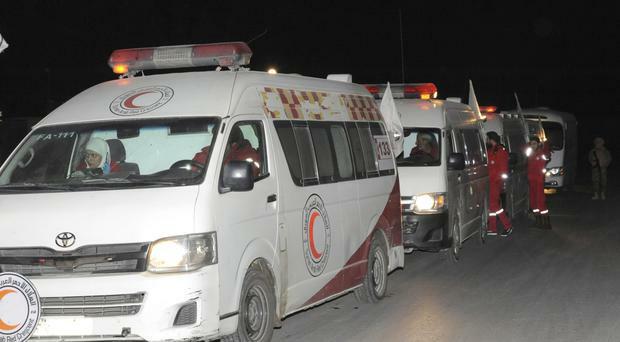 The International Committee of the Red Cross (ICRC) said the latest evacuations from eastern Ghouta, a suburb of Damascus, were carried out late on Wednesday and into Thursday in co-ordination with the Syrian Arab Red Crescent. It said more than half of the 16 medical evacuees were children. The government recently tightened its siege on eastern Ghouta, home to nearly 400,000 people, and has refused to allow hundreds of critically ill patients to reach hospitals located just minutes away, according to the UN. The ICRC said the government had agreed to allow 29 patients and their families to be evacuated from the besieged region - a sliver of the some 500 people listed by the UN as requiring urgent medical care in Damascus. More than a dozen have died waiting for evacuation, according to the UN. The Army of Islam, a prominent rebel group in eastern Ghouta, said the critically ill are being evacuated as part of a deal that was conditional on it releasing an equivalent number of captives. State-run news agency SANA confirmed the evacuations, saying that rebels have also released several people, including two children. The Britain-based Syrian Observatory for Human Rights, which closely tracks the conflict through activists and other sources inside Syria, said 17 patients have been evacuated since Tuesday. It said the Army of Islam has released 26 people, including eight minors and four women. The observatory said the war killed about 39,000 people in 2017, of which it documented 33,425 by name. The opposition-linked group, which monitors casualties on all sides of the complex war, said the dead included 10,507 civilians, 2,923 government troops and 7,494 jihadi fighters, mainly members of Islamic State and an al Qaida-linked outfit. Syria's nearly seven-year civil war has killed some 400,000 people and created the worst refugee crisis since the Second World War, with some five million Syrians having fled the country. Activists and the observatory reported heavy clashes on Thursday at the edges of the rebels' main enclave in north-west Syria, where the government is waging its first major ground offensive in years. The activist-run Shaam News Network said pro-government forces tried to push into the rural, southern areas of the opposition-held Idlib province with ground forces, under cover of air strikes. At least 24 rebels and al Qaida-linked insurgents, and 11 pro-government fighters, have been killed, according to the observatory. A 300-megawatt power station was knocked out of service in the neighbouring Hama province after it came under rocket attack by armed groups, Syria's state news agency SANA reported.